On June 6, 1944, two American airborne divisions were dropped east of the Contentin Peninsula. One of them, the 101st Airborne Division, was to open the beach outputs for the 4th Infantry Division, which was to land on Utah Beach and identify the passages of the Douve south in the marshes to meet and take Carentan, a small town in the heart of this aquatic area. It was also a strategic crossroads to the junction with the beachhead at Omaha Beach. To take Carentan, the American forces had to unite and a failure dangerously isolated the forces behind the foothold in the Contentin. The German army's large and an elite regiment, the paratroopers of Fallschirmjager-Regiment 6 von der Heyde, was nearby to face the 101st at the front line. This would be a fierce battle between US and German paratroopers in the St. Come-du-Mont area and in front of Carentan. The paratroopers of the 502 PIR attacked the floor with heavy losses at Ingouf Farm. This was the legendary battle of the "cabbage patch”. 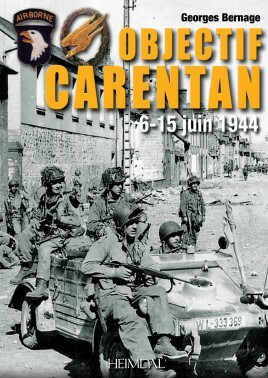 Overwhelmed in Carentan, von der Heydte landed into the night of June 11 to June 12, before the German attack against the 13 conducted with the "Gotz”. It was a failure, and the battle ended. The Americans ensured the junction between the two bridgeheads. This book follows these poorly known operations, day by day, with many testimonials and exceptional documents.